The first camera that used a roll of film, the Kodak, was invented by the American George Eastman in 1888. It was revolutionary for being both easily portable, easy to use, and relatively inexpensive. This democratic form of picture-making heralded a new age of the amateur photographer. 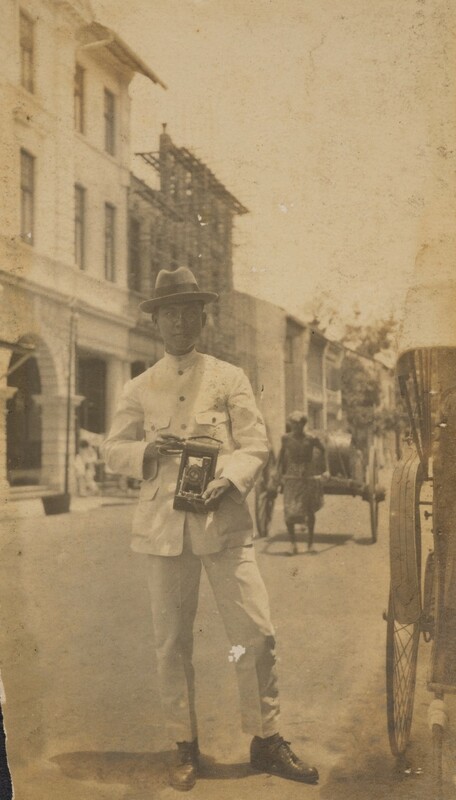 This snapshot taken with a film camera of a Baba in chic tropical style – a drill cotton closed coat (baju tutop) and fedora – and holding a camera epitomises the excitement of modernity among young urbanites, including Peranakans, in Singapore and other modern Asian port cities. Fedor Jagor, a German ethnologist, naturalist, and photographer, travelled in Southeast Asia in the late 1850s. In 1857 and 1858 he took many photographs of Singapore and its people. While here he met prominent Peranakan tycoon Tan Kim Ching. In the late 1860s, Jagor’s stereoview photographs of Singapore were published in Berlin. Stereoviews were popular in the 19th century. Two photographs of the same image are taken at slightly different angles and placed side-by-side on a card. When looked at through a binocular viewer, they create an illusion of depth. A note on the back indicates the photograph was taken in Singapore and that the subject is a rich Chinese merchant from Malacca “who has Malay blood through the women”. Although it does not specifically mention Tan Kim Ching, Jagor singles him out by name in his travelogue published in 1866. He also describes the Peranakan community at length, which altogether strongly suggests that the image is a portrait of Tan and his family. This stereoview is the oldest photograph on paper in Singapore’s National Collection. Commercial studio photography took off in Singapore and in other towns of Southeast Asia in the early 1860s with the arrival of European photographers. Soon after, many Chinese studios opened, often Cantonese from China or Hong Kong. These were quickly followed by the arrival of Japanese-owned studios. Peranakans numbered among the first patrons of these commercial studios. They commissioned portraits to memorialise important moments of Peranakan family life. Weddings were particularly popular themes. Peranakan wedding photography evolved its own aesthetics and conventions. Modern technology was borrowed, but not its cultural influences, thus photography constitutes one remarkable aspect of modernity in otherwise traditional celebrations. From the ways the subjects are dressed and posed, to the choice of the studio settings, studio photography in Asia – despite its static structure – displays a diversity of cultural responses in image making. In this photograph taken at Keechun Studio, the bride wears Penang-style Peranakan finery, which was a hybrid of Malay, Chinese, Indian, and Eurasian fashions. The groom is dressed in a rather informal jacket, with a light coloured shirt and tie, and long trousers. Although weddings ostensibly adhered to strict ritual protocol (often to ensure good fortune and fertility) such studio photographs also reveal the inconsistency and unpredictability of visual expression, such as the lack of strict dress codes. Modern photography reveals the paradoxes of Peranakan and Asian life: images that attempt to convey tradition often reveal so many unconventional elements. Space, time, and memories invite visitors to think about advancements in technology and how we use photography today. Digital photography, with the help of social media, has become one of the most democratic and dramatic forms of human expression. Why do we take photos? How do we use them? 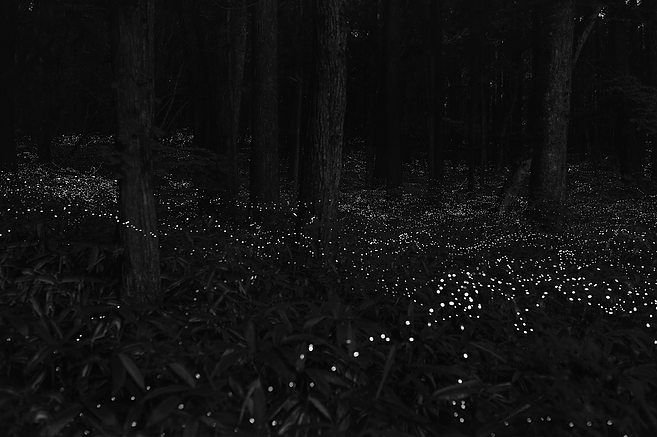 Through photos, what are we trying to say about ourselves, our lives? We invite contributions from you. Show us your Singapore and your Singaporean life. Send us photos from the family album, or a snapshot taken today with your phone. Together we create Space, time, and memories. The first commercially viable form of photography was invented in France in 1839, and it quickly made its way to Southeast Asia. Peranakans were among the first subjects captured by photographers arriving from Europe. Amek Gambar (“taking pictures”): Peranakans and Photography presents early photographs of the community, including the oldest example in Singapore’s National Collection: a portrait of a Peranakan family taken in 1857 and 1858. European photographers established the earliest commercial studios in Asia, and almost immediately enterprising Asians learned the new technology and started studios of their own. Many Peranakans were among those intrigued by this fledging art. They captured their own likeness and dress, their cities and their rituals. The exhibition includes studio and amateur photographs of Peranakans in Singapore, Malaysia, Indonesia and Myanmar. In celebration of a donation by Mr and Mrs Lee Kip Lee of 2,535 photographs to the Peranakan Museum, Amek Gambar explores the multifaceted role of photography in the lives of Peranakans.